Survivor: The Amazon (2003) - 13th place, 4th out. Voted out in Episode 4, "Trapped" (Day 12). The Amazon Ep. 1 IC: "Unchained" - Works the puzzle with Jeanne, and Jaburu wins! The Amazon Ep. 2 RC: "Flip Out" - Successful caller for Jaburu, as Jaburu wins again. The Amazon Ep. 2 IC: "Total Recall" - Correctly answers her question, but Jaburu loses, 6-4. The Amazon Ep. 3 RC: "Matchmaker" - Not shown making a match, but Jaburu wins, 18-14. The Amazon Ep. 3 IC: "The Great Escape" - Unties knots, and Jaburu wins. The Amazon Ep. 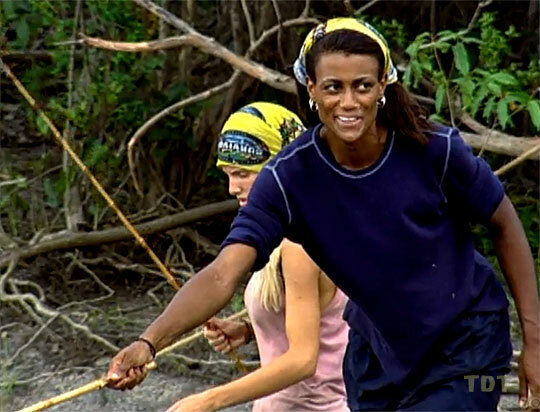 4 RC: "Light My Fire" - Argues with Christy over holding fire, Jaburu loses. The Amazon Ep. 4 IC: "Gone Fishin'" - Catches fish, but Jaburu loses. The Amazon, Ep. 4: Four votes, from Jenna, Heidi, Christy, and Deena (voted out, 4-2-1). I will always wave my finger in your face. Whoops, wrong season. 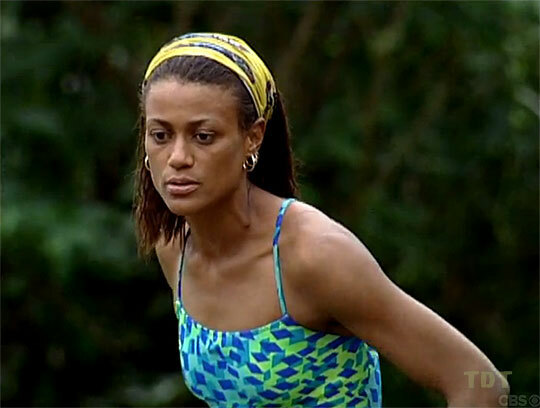 Jaburu escapes the cage, wins immunity! Only because you asked me to! Rome Neal at CBSNews.com (2/26/03): "JoAnna Hits the Road"
SurvivorOz podcast interview (8/18/12): "JoAnna Ward Interview"
"Born and raised in Niagara Falls, N.Y., JoAnna Ward moved to Atlanta with her family when she was an adolescent. She moved to South Carolina to attend college after being recruited on a basketball scholarship. She went on to receive her bachelor's degree in English education and her master's degree in education in school guidance counseling from South Carolina State University. She currently works as a school guidance counselor. She is also an Aerobics and Fitness Association of America (AFAA) Certified aerobic instructor. Ward enjoys fellowship with Christian believers and spending time with her son, Dontré. She also enjoys tae bo, basketball, mountain climbing and running. She describes herself as strong, courageous and independent. If she could hold political office, she would become the mayor of a small town. She has done several commercials and made a brief appearance in the movie Juwanna Mann. She considers her greatest achievement to be when she became a born-again Christian which she feels changed her into a better person. "One of my most enjoyable hobbies is lifting up the name of the Lord Jesus Christ in pure praise and worship." She considers her mother, who recently passed away, to be the most influential person in her life. Having had the support of family and friends, she is doing this to prove to herself that she is truly a survivor outside of life's common adversities. If she wins the $1 million, she will buy a new house. Ward is currently single and living in Orangesburg, S.C. Her birth date is April 29, 1971."